Partitioning isn’t something most users will need to bother with, but you may need to work with partitions when installing an operating system or setting up a new drive. Many drives come with a single partition already set up, but all storage devices are just treated as a mass of unallocated, free space when they contain no partitions. To actually set up a file system and save any files to the drive, the drive needs a partition. The partition can contain all of the storage space on the drive or just some of it. On many storage devices, a single partition will often take up the entire drive. Partitions are necessary because you can’t just start writing files to a blank drive. You must first create at least one container with a file system. We call this container a partition. You can have one partition that contains all the storage space on the drive or divide the space into twenty different partitions. Either way, you need at least one partition on the drive. After creating a partition, the partition is formatted with a file system — like the NTFS file system on Windows drives, FAT32 file system for removable drives, HFS+ file system on Mac computers, or the ext4 file system on Linux. Files are then written to that file system on the partition. 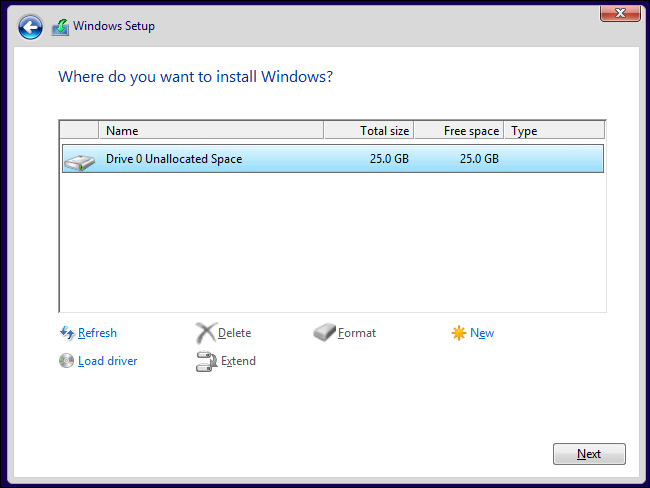 You probably don’t want multiple partitions on your USB flash drive — a single partition will allow you to treat the USB drive as a single unit. If you have multiple partitions, multiple different drives would appear when you plugged your USB drive into your computer. However, you may want multiple partitions for other reasons. Each partition can be isolated from the others and even have a different file system. For example, many Windows computers come with a separate recovery partition where the files you need to restore your Windows operating system to its factory default settings are stored. When you restore Windows, the files from this partition are copied to the main partition. The recovery partition is normally hidden so you can’t access it from Windows and mess it up. If the recovery files were stored on the main system partition, it would be easier for them to be deleted, infected, or corrupted. Some Windows geeks love creating a separate partition for their personal data files. When you reinstall Windows, you can wipe your system drive and leave your data partition intact. If you want to install Linux on your Windows computer, you can install it to the same hard drive — the Linux system will be installed to one or more separate partitions so Windows and Linux won’t interfere with each other. Linux systems are generally set up with multiple partitions. For example, Linux systems have a swap partition that functions like the page file on Windows. The swap partition is formatted with a different file system. 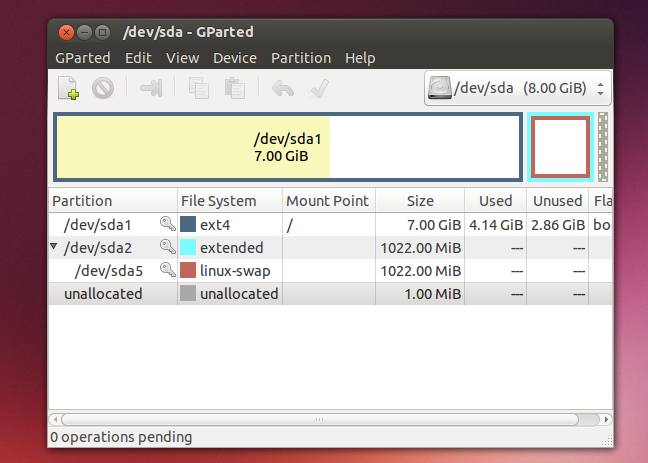 You can set up partitions however you like with Linux, giving different system directories their own partition. You can also use tools like the Disk Management tool in Windows and GParted on Linux to manage partitions on your system drive or other drives. You can’t always modify a partition while it’s in-use — for example, you can’t delete a Windows system partition while you’re running Windows from it! — so you may need to boot from a Linux live CD or use an operating system installer disk to make many changes. These tools allow you to partition your system drives as well as other internal drives, external drives, USB drives, SD cards, and other storage media. 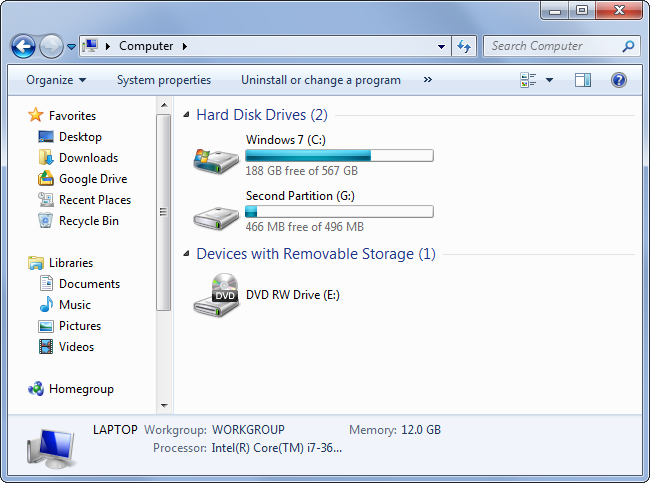 Operating systems display separate partitions as separate drives. For example, if you have a single drive with 500 GB of storage on your computer, you’d have a C:\ drive with 500 GB of space available to you in Windows. But, if you partitioned that drive in half, you’d have a C:\ drive with 250 GB of space and a D:\ drive with 250 GB of space displayed in Windows Explorer. These drives may look like separate physical devices, but they don’t function that way. Although they appear as different disks, they’re still the same physical piece of hardware. There’s only so much speed to go around. You don’t gain the performance benefits from using two separate partitions that you do from using two separate physical drives. Most people won’t have to worry about this, as drives generally come with a single partition set up, operating systems partition automatically, and so on. However, it’s helpful to know how partitions work when you need to get your hands dirty.